Some years ago(I dare not count how many) I had my first encounter with the fantasy strategy game Warlords: Battlecry III. The game was nice and I liked it a lot, so when a friend told me that there is a match-three game(The one and only Puzzle Quest) set in the same world I was really curious. That's how I for a first time met something that turned to be one of my favourite types of games - the "puzzle RPGs". Sadly they're very rare and when appear they are not always well done. But recently at the market appeared a gem in this genre - Ironcast. The game is funded by Kickstarter and developed by Dreadbit. It was published in March 2015. In Ironcast you take the role of a British steam-punk mech commander, which will have to take part in the defence of his motherland. It’s the 18th century, Britain and France are waging a bitter war, but France has taken the lead and it is now on British soil, the invasion is a fact, the British forces are hard pressed to the wall. It’s time for you to jump in the fight. 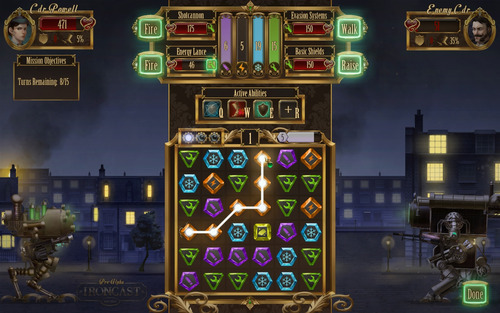 While Ironcast slips in the match-three genre, it’s a more a connect three game much like Dungeon Gems. Because of this in the game you will be able to connect diagonally too instead of only horizontally and vertically which will allow you to make a lot longer chains. Now the longer chains come at a price, there will be no stunning cascades of matching gems, which to be honest is one of the biggest charms of match three games. But don't fret as Ironcast has so much to offer that you will not miss the cascades at all. First of all maybe I should mention that Ironcast is a roguelike. You die in a fight; you're dead and will have to start from the beginning. This will be bad in most match tree games, because of the big role that luck and cascades can play, but not so much here, because although the gems present on your board are dependent on luck, cascades that can swing the battle in one or another direction are not present. In other words the roguelike element brings only good to the table, making the game tenser and making you think and plan ahead. The fights follow the Puzzle Quest model - you collect resources from matching gems, then you use those to activate skills and items. 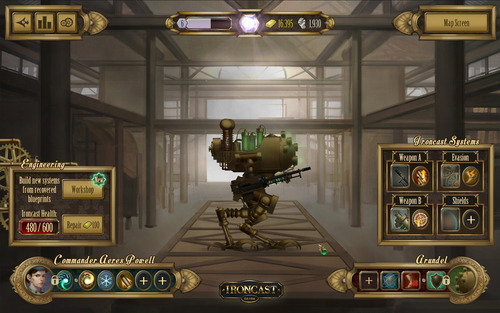 To be more precise in Ironcast you will fire weapons, rise shields, repair damage and make your mech move. Unlike Puzzle Quest the fights are very well animated - your mech will tremble under attacks, will catch on fire, the shield will be visible when active, it will walk when you order it to and also the outlook of your machine will change when you equip different weapons. Unlike other games from the genre your enemy will not play his moves on the same board as you, but on another and you will never see his moves. Which brings the question that always comes up with those games - does the AI cheat? To be honest I had many moments in Puzzle Quest in which I found the moves of the AI too perfect to be pure luck, but while I don't see the moves of my enemy in Ironcast I never really felt like he is cheating. For every fight that you win you will gain experience, money and blueprints. With enough experience you will gain levels (shocking!!!! ), when this happen you will have choice between three random skills which can be either for your mech or for your commander. The money you will use to repair the hull of your machine after each battle and also to turn blueprints into actual parts for your mech. As in most games and all modern roguelikes when you die you will collect Global Experience and with gaining Global Levels you will unlock new skills for your mechs and Commanders. You will also unlock new mechs and Commanders. The missions that you will complete will not be only "Defeat this enemy in this number of turns", instead there will be survive missions, retrieve parts from enemy mechs, bossfights, collect specific resource, etc. All fights have limited number of turns. Ironcast is very...niche game as it is its predecessor Puzzle Quest, its neither a really casual game, but it is not "gamers" game neither. It’s for those moments when you want to kill some time, but the standard match three game just doesn't cut it. But despite this Dreadbit have put their heart in it by mixing few proven to work things together they have created a game that has pushed the limits of the genre even further raising the bar higher for every new "match three RPG" that may come out in feature. And its not only the gameplay, but the graphics too. 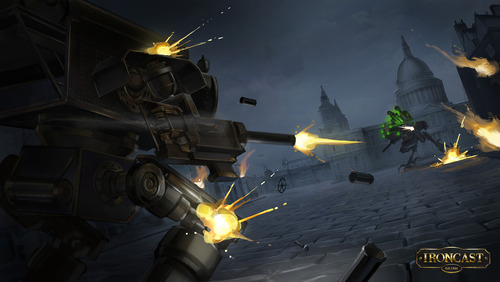 The mechs are detailed, various and change their outlook when equipped with different parts or when damaged in a fight. But at the same time they successfully give the feeling that you're in 18th century with their crude, clunky look. The same goes for your Commanders, their outfits and looks as a whole are good copy of 18th century fashion. Together those two create nice steampunky atmosphere. 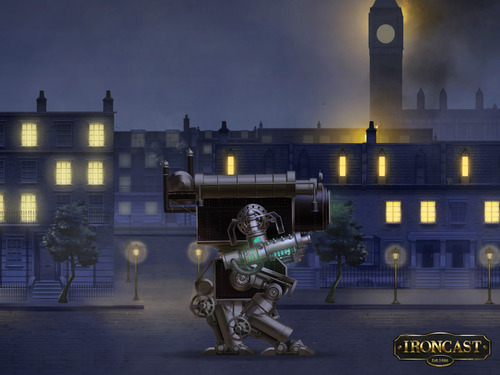 Ironcast is really good game and if you have returned many many times back to Puzzle Quest and other games from the genre, looking to satisfy this specific need that those games create, now you have the chance to try something new that will give you this same amount of satisfaction if not even more.